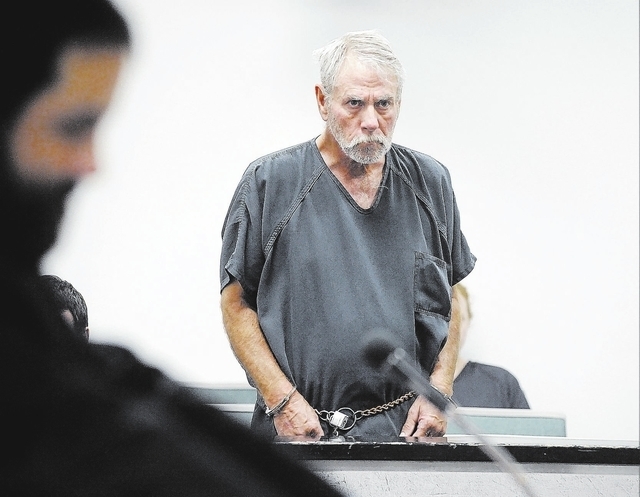 Boulder City resident Peter Bennett had his bail reduced to $150,000 Tuesday, after the district attorney’s office agreed the amount was sufficient to keep the 67-year-old in the area to appear in court. Bennett had been in the Clark County Detention Center since his Aug. 29 arrest on $720,000 bond. He was being held on felony charges of attempted kidnapping, attempted sexual assault and four counts of open and gross lewdness. Bennett was initially charged with six felony counts of open and gross lewdness as a result of a warrant issued by the Boulder City Justice Court. He posted bail on those charges, which involve an alleged incident with a 15-year-old female Sept. 14-15, 2012, according to court papers. He was then rebooked on the other charges, which stem from an alleged incident at the corrals at the Boulder City Horseman’s Association on Aug. 17. As part of the lower bail, Bennett is not to have contact with anyone involved in the case, or people under 18 years old. A preliminary hearing was set for 1 p.m. Sept. 24 in Justice Court, when Bennett is expected to enter a plea. Sheets also questioned that if police thought Bennett was a danger to the community deserving high bail, why didn’t they seek an arrest last year after investigating the initial incident. Those charges were filed only after the second victim was found months later, Sheets told the court. Sheets said after the hearing that he questions the length of time between the initial investigation, which he says was concluded in October, and the charges being filed after the second person came forward. “Once we dig deeper into this we’re going to see there’s other motivations for the accusation, and my client will be exonerated,” Sheets said after the hearing. Sheets also pointed to Bennett’s ties to the community in arguing for the reduced bail. Bennett has lived in Nevada for 57 years, and at his Boulder City residence for 25 years with his wife of 43 years, Sheets said. Boulder City Detective Tiffany Driscoll said Aug. 29 that the facts of the case lead police to believe there may be more victims, but she declined to discuss specifics. “If you’re a parent and your child has been with Mr. Bennett, alone with Mr. Bennett or worked with Mr. Bennett, we would really appreciate it if you came forward,” Driscoll said. The investigation is ongoing and police urge anyone with information to contact Driscoll at 702-293-9297 or tdriscoll@bcnv.org, or the Boulder City Police at 702-293-9224. Contact editor Arnold M. Knightly at aknightly@bouldercityreview.com or 702-586-9523. Follow the paper on Twitter: @BCReview.